Tell your mom how much you love her this Mother's Day. 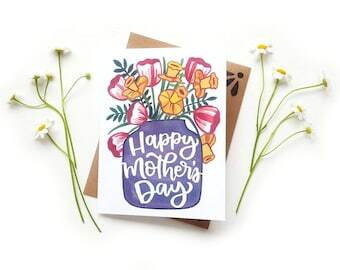 Perfect for the new mom celebrating her first Mother's Day, or the mom celebrating her 20th! Every item in the Sketchy Notions shop features original line drawing, watercolors and/or hand-lettering! All of our envelopes are hand-stamped. Yep, every single one. We love handmade and hope you do too! It will be shipped First Class in a stiff flat envelope unless otherwise specified. Need it gift wrapped? Send me a message! Can't wait for mother's day! 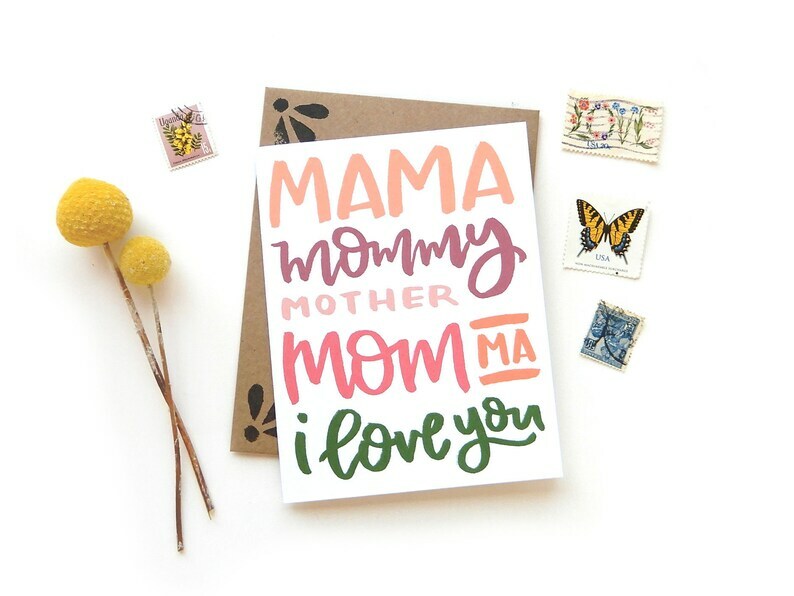 This is the perfect card for my mom. adorable cards, fantastic customer service and super speedy shipping. thank you! So cute, I love it!! Beautifully packaged and shipped quickly. Thanks so much! Unless otherwise noted or requested, all items will be shipped via the USPS and Priority Flatrate. This includes insurance and a tracking number. Domestic shipping usually arrives within a week. All items will be wrapped to ensure safe delivery, both with domestic and international orders. There are listings for multiple customized items in my shop. Please allow at least 1-3 weeks for your item to be created and shipped. Custom orders purchased without prior consultation could result in additional charges. Please message me to discuss your custom order prior to purchase. If you have a rush custom order, please message me prior to purchase. Custom items that are rushed will be charge a rush fee (10-15% increase). All illustrations, designs, custom children's books stories, wedding albums and photo albums are property of Chelsea Ward and © Sketchy Notions. This includes any draft or final text, illustrations and/or designs. They are NOT to be reproduced or distributed in any form without written permission by Chelsea Ward herself. Failure to adhere to these stipulations could result in legal action. All items are wrapped in butcher paper and tied with bakers twine, in addition to being wrapped to withstand shipping. If you require further gift wrapping or a special note to the recipient, please leave a "Note to Seller" at check out or message me. All Sketchy Notions cards, prints and calendars are available for wholesale. Please message me to receive a link to my Etsy Wholesale Linesheet. Illustrations: Damaged prints or illustrations can be replaced for the full retail price, unless an item arrived damaged due to shipping. Books & Albums: Damaged books or albums can be returned for repairs/rebinding. The cost for a book repair is the amount of materials (paper to replace damaged covers/pages), time to repair, and shipping.